Social media is now so dominant that any app that wants to appeal to writers of travel journals needs not to ignore, but embrace them. BonJournal does just that – and more. With a social media-like design that’s easy to use and quickly recognisable, Bonjournal is a bit like Instragram for words. you can follow ‘featured’ members’ travels and write-ups, while the app can also find out if any of your contacts on Facebook or Twitter are also using the app. Relying on simple text entires and photos, trips are laid-out by day on Bonjournal, and it’s great for browsing others trip journals, too. As well as being able to save a page to read later, you can add comments on anything. 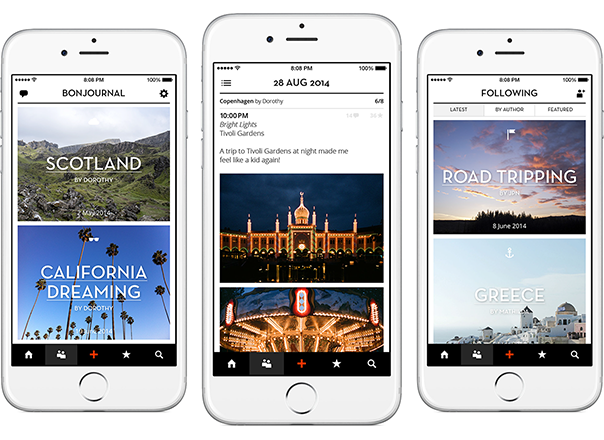 It all gives BonJournal a distinct community feel that makes it a fine app for travel addicts on the road.